The following content is used with the permission of Craig Patterson of Caribou Ranch Studios. 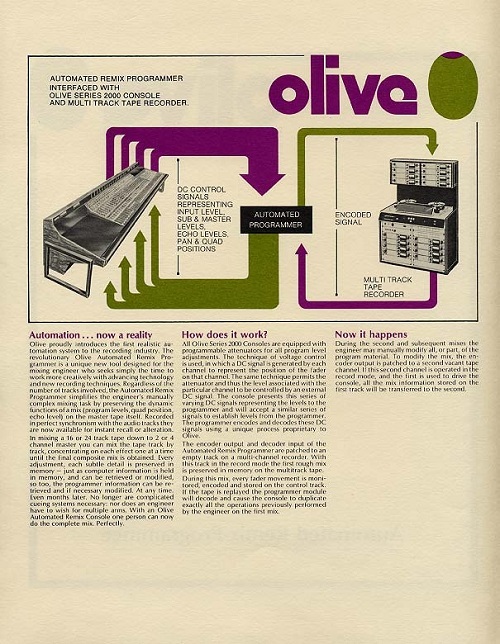 The initial vision for the Olive console came from Wayne Jones in 1969. 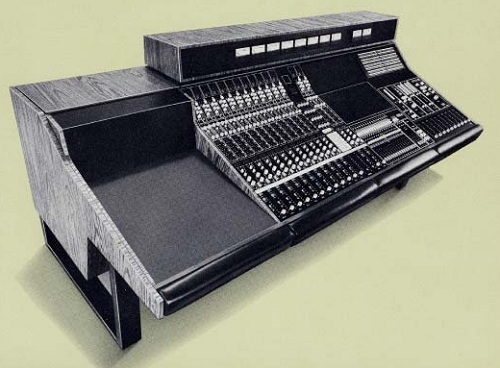 At that time, consoles were being built in one of two ways: completely custom with the whole control surface built as one custom panel, or modular using individual functional elements such as faders, equalizers, and compressors. Electrodyne had pioneered the concept of the strip modularization, laying out each input channel as a vertical column. The column itself consisted of a series of individual modules starting with the fader at the bottom and working up to channel switches at the top. Using this modular approach, consoles with different quantities of inputs could be constructed by assembling side by side strips. Quad Eight and Automated Processes (later API) would later continue this approach. Using this technique, a custom console could be designed using standard components, thus reducing the engineering effort, risk, and development time. Yet a customer could configure a console unique enough to suit their particular needs. While this approach had obvious merit, Jones believed there was a cost burden added with this degree of modularity. Each functional block needed its own expensive housing, interface circuitry, and perhaps even power supply. 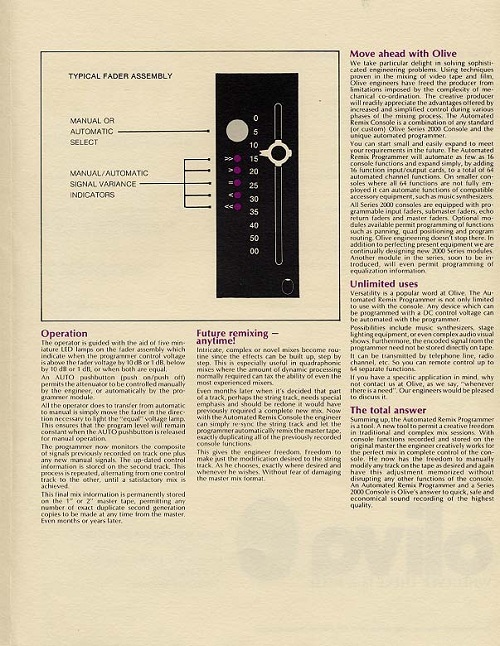 Jones started Olive with the belief that a single input channel strip module with all of the functions integrated would be more cost effective. But it would have to include all of the functions commonly wanted by users. He reasoned that a single module circuit board and single metal housing would lower the cost compared to individual modules, and that the more circuit boards were used for wiring rather than conventional point to point wiring, the cost would ramp down while the reliability ramped up. 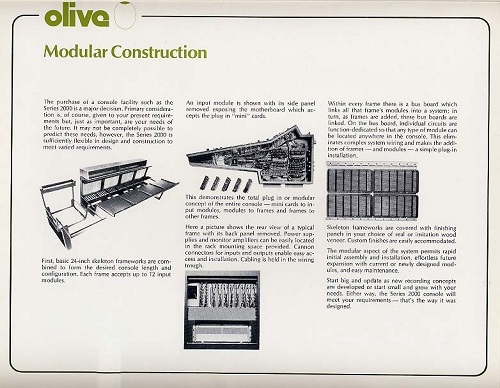 Continuing this mindset, he wanted to use circuit boards to interconnect the input module strips, and to carry the modular approach all the way through the construction, even to the large console housing. Two-foot wide frames would be made that could be bolted together to make console widths in multiples of two feet. All of these presumptions turned out to have merit, but the execution would have flaws. The tolerance buildup caused by alignment of the two-foot frames and associated two-foot bus boards compromised the integrity of this busing concept. The alignment of the connectors on the input modules that plugged into the bus boards was also compromised due to the distances involved. The result was that modules did not always seat correctly and the contacts between the modules and the bus boards were not reliable. This was a major source of reliability issues for the console. But these flaws wouldn't present themselves until after the company had started to build its first set of consoles. 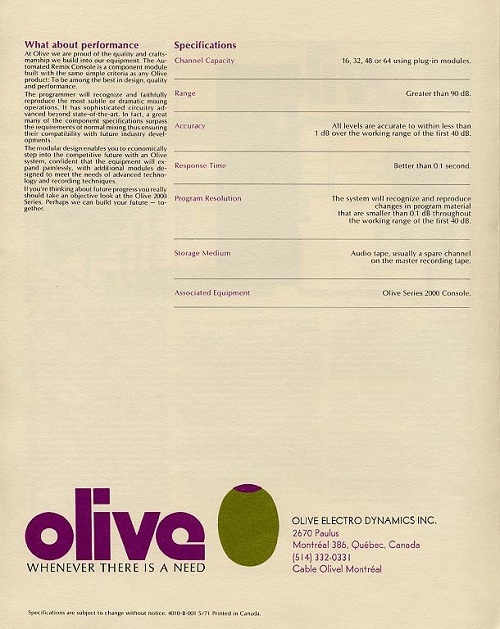 In 1971, Jones formed a Canadian company called Olive Electrodynamics. His vision was to produce semi-modular integrated consoles with every conceivable feature usually reserved for outboard gear, built right in. His dream involved gating and compression on every channel; four-band EQ on every channel; automated fader movement; storage of automation data on multitrack; VCA subgrouping; Op-Amps; computer-controlled matrix routing; FET switching; current-mode summing busses; ,and ten tape machine remotes, along with many other features. None of these features were currently available in any console at any price. Though Jones had the Genesis of the Olive design in his head, the realization of the ideas and the details of design were the work of design engineers Ed Meitner, Carl DeWilde, and Ed Fox. Meitner in particular made a large number of contributions, and worked unimaginably hard to realize the dream. 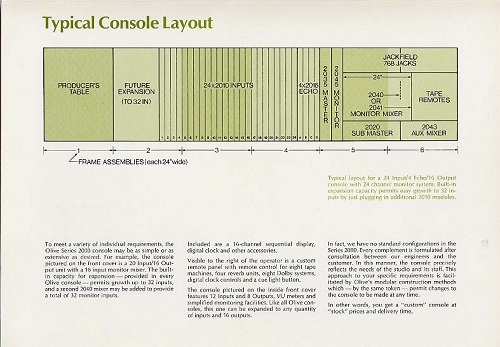 About the equalizers, Jones recalls, "There were a variety of equalizers in use in consoles at the time. Some simple ones with two bands: a low frequency and a high frequency adjustment. The Automated Processes 3-band equalizer seemed to be popular but I had heard that some producers considered the single mid-band control insufficient at times. I thought if we made a 4-band equalizer, we could satisfy everyone. While the AP equalizer was a good model, I questioned the ergonomics of the rotary controls. It was hard to see the designations around the full circle of the rotary control while sitting at the console. Digitran, a switch manufacturer, had just introduced a new twist to the then popular thumbwheel switch, namely a lever wheel switch. They replaced the traditional cumbersome thumbwheel with a very ergonomic gear ratio lever actuated switch with a very smooth action. As the lever was moved over its short travel of perhaps 90 degrees, the indicator wheel and associated switches would travel over their full 360 degree rotation. This was perfect to design a dense multi-control equalizer in a small space but provide an ergonomic design. Four multi-frequency controls and four dB level controls plus four boost/cut switches in a 1.5kHz x 6Khz space. We had Digitran custom manufacture the switches with the special frequency and amplitude designations printed on the wheels and the circuit boards housing the switches extended out to accept the capacitors and resistors for the tuned circuits. This made a very efficient and compact design." Jones knew that gain processing devices were not popular as built in devices on every channel. Normally rack mounted boxes that could be patched into a particular channel were used as a matter of necessity. Paul Buff, founder and brilliant chief designer of Allison Research (Allison was Pauls wife) was selling his Kepex, a remarkable expander and noise gate, and he would later introduce the Gain Brain, and there were many other outboard compressor/limiter/expanders as well. Jones thought that if he and his staff were clever enough, they could include a very flexible gain processing device on every input that could emulate the functionality of most of these outboard devices, a task not yet achieved at that time. Early on, Jones decided that the primary gain setting device on every channel should be a Voltage Controlled Attenuator/Amplifier (VCA). This would allow more flexibility with fader choice and allow a new sub-grouping functionality. But VCA technology was not well refined at that time, and had not yet reached into the audio world. There were many approaches using integrated circuits and discrete circuits but they all had limited range perhaps 60 dB or so and added noise and distortion. Dave Blackmer, another brilliant engineer who ran DBX, had developed a unique current mode VCA that had significantly better performance than anything else on the market. But the modules were expensive and unfortunately prone to self-destruction under certain conditions. They were built as log control amps, meaning they could be used with a linear-taper fader. Since the P&G faders Olive decided to use were audio-tapered, the log function of the VCA needed to be converted to linear function via an antilog circuit. That antilog circuit is unipolar, but couldn't deal with an incorrect offset that might cause it to seem to go below zero voltage. This caused many to fail upon installation. At $50 apiece and with a potted repair-proof design, this caused headaches. But they provided the quality so they were the choice. Up until that time, mixing console signal paths were straight forward: each input could be switched to one or perhaps more than one output channel. Each output channel went to one track of the multi-track recorder. Submaster faders were gain controls of the output channels. On earlier consoles, with only four or less output channels, a master fader controlling the gain of all the output channels was possible. 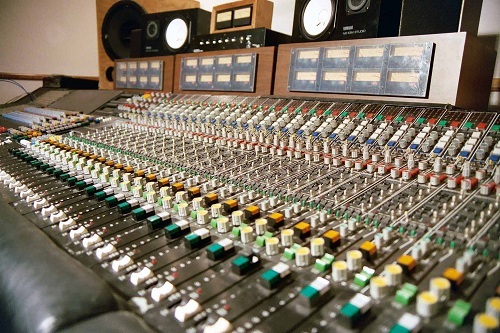 But there were no 16-channel faders, so there were no master faders on large consoles. 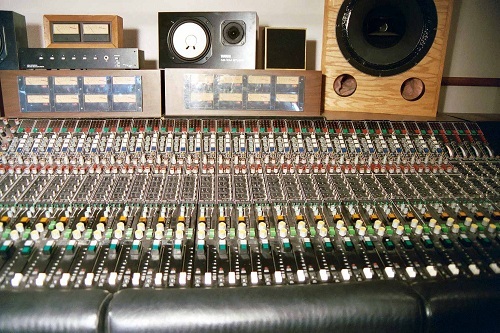 Jones recalls; "If you used several mics on a group of instruments, perhaps strings or drums, you could assign them to individual tracks to give flexibility during the mix down. If you chose adjacent output channels, the submaster faders would also be adjacent but there were as many of these as output channels. With VCAs, the input gain was set by a DC control voltage so it was possible to control this DC voltage in various ways by simply grouping faders. Now there was no requirement to hard-map the relationship between output channel and submaster faders. You could have five mics on the drums going to five tape tracks respectively, but all controlled by a single group fader. You could assign level control completely independently from channel and tape track assignment. This was perhaps the most difficult new feature to explain of the system to prospective customers. I recall many times trying to explain this to someone at an AES convention only to have their eyes glaze over. Every once in a while, someone would suddenly get it and their eyes would light up as they realized what this meant and the advantages it would provide." Every console had to have a switch for every function and routing possibility. The more sophisticated ones used illuminated switches and push buttons to provide better user feedback. This illumination used hundreds of small incandescent bulbs. These consumed a lot of current and produced a lot of heat. But worse than that, they were always burning out. The more accessible ones could be replaced from the top of the console, but some required removal of a module. So part of studio maintenance was bulb replacement. 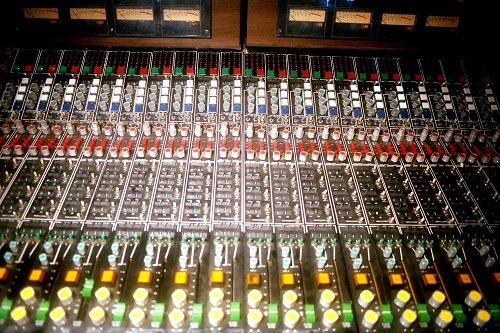 And mixers had to use consoles that almost always had a few burned out bulbs. Light emitting diodes (LEDs) had just come on the market. They were expensive, not very bright, and inconsistent in intensity from unit to unit. But they didnt burn out and took less current and less space. With 16 output channels on each of 20, 24, 32 or more inputs, this was a lot of indicators, so Jones wanted to use this new device. Consoles also had VU meters as output level indicators. On earlier 2, 3, and 4 channel consoles, these worked just fine. But with 16 or 24 output channels, it was hard to concentrate on all the meters and see when a channel was overloaded. Jones believed that a multichannel level display using closely-spaced vertical bar graphs constructed with LEDs would provide a more useful display. While Jones doesn't claim originality on light-based vertical bar graphs, there was still no other console that used lighted bar graphs as level indicators at that time, certainly none that used LEDs. 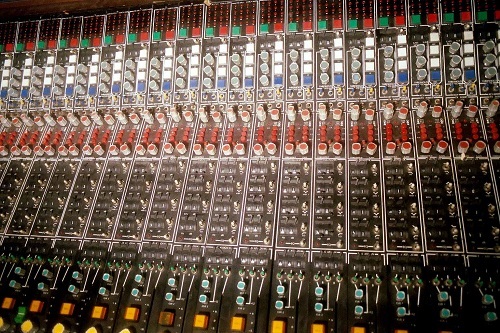 With increasing demand for more signal routing choices in the ever-expanding large console, many switches are required. Switches are expensive, space consuming, and can compromise the reliability of the system as the contacts degrade over time. There were methods to switch signals using electronic circuits but this technique had not yet found its way into recording consoles. Jones believed he could lower cost, reduce panel space, and most importantly, improve long-term reliability by using solid-state switching. Olive developed a simple switch using FETs that met all of the requirements. To set the state of the switch, a central control system with a small keyboard was developed. Engineers loved the fact that you could clear all of the output assignments with just a few key strokes, not the more typical process of manually setting hundreds of mechanical pushbuttons. To indicate the state of the switches, the new LEDs were used. At an early point in the development of the company, Jones wanted to offer the capability of automating the mix down process. He had heard from engineers that this was one of the more challenging aspects of producing a master. Each time the mixdown was performed, some little flaw might show up. The mix was set up again, only to miss something else. Including VCAs provided the path for automating the mix downs. Olive contracted with a couple of engineers with converter and digital electronics skills to create a system that would monitor 16 or more DC voltages and produce an analog FSK (Frequency Shift Keying) signal that could be recorded on one track of the tape recorder. This could be played back with the rest of the audio tracks and the DC control levels would control the VCAs to automate the mix down. This was the first appearance of any sort of automated mixdown, years before Neve or API would be able to include the feature. The first public demonstration of this capability was at the October 1973 AES convention in Los Angeles. There was a large console on the show floor. Off site, at the Westlake Audio sales offices on Wilshire Blvd, the prototype Automated Mixdown system was set up for demonstration to selected potential customers. This proof of concept demo was done using a bank of outboard VCAs connected to another (non-Olive) console and controlled by the computer. Because the Olive console itself was not ready for this demonstration, some have doubted whether the concept ever actually worked. But Ed Meitner, President of EMM Labs, would disagree, having viewed the demo himself. The fact that it was controlling another console didn't mean it didn't work; it only meant the Olive console wasn't yet finished. There is still doubt about how much this feature was used in the production consoles, so more research is needed. To assist him in the mammoth task of creating this dream console, Jones had a staff of five additional people. Ed Fox was responsible for system design, Carl DeWild handled digital design and comp/lim/exp project, Ed Meitner tackled all the analog - pre, EQ, input strip, and measurements, Steve Lyman was in charge of the mechanical packaging. Donald Gaubatz took the title of Chief Engineer. Because of the intense pressure to get the product built, they mostly communicated with each other through an intercom, and had locks on the inside of their doors. Olive was a 24/7 affair, and Ed used to sleep outside the office in his car. When a new input strip came off the line, they would knock on his car window to wake him up for testing. This was a monstrous undertaking, which was made more obvious by the fact that no other manufacturer was willing to commit to anything approaching that scale of technology. To help fulfill this vision, Wayne received assistance from the Canadian government and began his R&D stage. In 1973, after pressure from the government agency in charge of that assistance, he decided he needed to bring the console to market to appease them, somewhat before he really felt it was ready. His second grant, for marketing and manufacturing, depended on it. Really though, Olive was growing too fast, and the company wasn't ready for the financial pressure of getting things out. At the first AES show in L.A., they booked 20 or 24 orders, and it would have continued if the second government grant had come through. There was also a mastering console in the works, as well as a number of other projects, none of which got off the ground in time. Even with all the innovations found in the Olive, it was not without problems. In addition to those previously outlined in the design, there had also been reports that channels would sound different for no apparent reason, undoubtedly because of tolerances not suited for audio. Another example was the hurdle of trying to get the op-amps to work properly. Made by National Semiconductor, the amps put into the prototype console were first-run op-amps built as a small batch, and thus they were way above spec. But the Olive engineers didn't know that this was an anomaly, and ordered a production run. When the production run arrived (the first LM301s), they wouldn't go anywhere near 20KHz. In fact, they were lucky to achieve 8KHz. Thus they had to convince National to go back, re-spec, and re-run the batch, because the console's radical new design precluded the use of anything but VCAs, and there were no others remotely suited for audio. Because the Olive staff all knew they were doing something that no one else was doing, none of these issues seemed like a nightmare. For his part, Ed feels as though it really defined his future path. It was his first real job when he came to Canada. Piecework on PA systems, guitar amps and the like were keeping food on the table, but after TBone Walker and Big Mama Thornton needed some work from him, Wayne heard his name, and invited him over to the Olive fold. Right at the time that Olive was getting started, Jim Guercio was opening Caribou Ranch, nestled high in the Colorado Rockies outside Nederland, with some very impressive clientele already waiting to get in. Guercio and Caribou took delivery of the largest version of the 2000 series, with 36 input channels, a ten-tape machine control section, and several other extra-cost enhancements. The price of this console hovered around the $250,000 mark, in 1971 Canadian dollars. Only two other consoles were being built, but by the time the 1971 AES show rolled by, between 20 and 24 had been pre-sold. There are varying accounts of who actually received consoles, but at this point we know definitively of only two: The first went to Thunder Sound in Montreal, and the second to Caribou Ranch. But since there were so few completed, Olive felt it wise to send a technician, Frank Lee, along with the console to Nederland, Colorado to help out in case anything went wrong. It did. The desk was at first unable to pass audio, despite the best attempts of Lee to wring out issues that had not yet been fully addressed at the factory. Audio was quickly sorted out, but the differing-channel issue and other quirks did not sit well with Guercio. During the six months of Lee's on-site presence, though there was a great deal of progress, clients were piling up, and Jim knew he had to act fast. So he called some friends at Neve, who told him that George Martin was planning on getting rid of his current desk, a 24-input 8016. A very short time later, that Neve was in place at Caribou, and the recording of artists like Chicago, Elton John, and Blood, Sweat and Tears commenced. During Caribou's tenure, the Neve 8016 was replaced with an 8078, but the fantastic Olive 2000 was left to sit in storage, waiting for its day. Like H.G. Wells' Time Traveller, it watched helplessly as the world passed it by. It sat as other manufacturers stole ideas, borrowed design features, and completed research that Wayne was unable to. Within the year, other manufacturers had adopted VCAs, op-amps, and automated mixdowns, and the rest of the list wasn't far behind. Jones had to move on, forming Amber Electro Design (bringing Meitner on later) and trying to forget about the whole experience. Westlake Audio had accepted money for at least six other consoles, and Mastering Engineer Glenn Meadows (who was with Westlake at the time) says that they were forced to deliver API consoles instead. Caribou had to move on as well, recording dozens of platinum albums, bringing in every prominent producer and artist, and achieving a status as a destination studio unparalleled by any other in the nation. There was no time for the Olive, and it was all but forgotten. Then, in March of 1985, Jim woke up to the smell every business owner dreads. It must be noted that this portion of the Olive History is in dispute. Mike Mastro, a firefighter on the scene at the time, has given us this account. However, Jim Guercio disagrees with everything Mike has to say, even to the point of threatening legal action against us for reporting what Mike said. When invited to give his version of the events, Mr. Guercio did not respond. If he does ever respond, we will be happy to include his comments. A fire had started in the building's mechanical room, just below the studio control room. Something odd had contributed to the fire's beginning. Because of a fear that the sprinklers might turn on during a session, they were routinely turned off when recording took place. Accounts have been related that during a period when someone forgot to turn them back on, one of the sprinkler pressure pumps overheated, starting the fire. However, Mike Mastro, one of the firefighters who was actually on scene, knows what really happened. The mechanical room wasn't as well heated as the rest of the building, so in order to keep the sprinkler pipes from freezing, space heaters were deployed. The extra load cause an electrical short, and the fire started within the walls. Once the fire department arrived, they couldn't find any flames, just smoke. After what seemed like an eternity of searching, the entered the control room and saw a glow over one wall. They had no choice but to start pumping water at the wall. Jim felt that this drastic measure may not be necessary, as the overbuilding of the structure would cause the fire to be contained without the need for further destruction. Everyone's heart sank as the water started up, but even with the glow, no flames were found. Firefighters eventually resorted to chainsawing holes in the walls and filling the cavities with water. The fire continued its in-wall journey through the huge barn that housed the studio complex, eventually getting to the lounge, over the control room. Any hope of saving the Neve was dashed as the pool table from the lounge fell through the floor, cutting what was left of the Neve 8078 in half. Fortunately, Mastro and other members from the team were at least able to save every single master tape, the gold and platinum albums, and quite a bit of equipment, including dozens of microphones. Observers were stationed at Caribou for an additional 24 hours, to wait and see the results, since no flames were ever found. Though the building was never fully involved, it still was a total loss. It must also be noted that the following paragraph was related to us by Roy Pritts, now deceased. Jim Guercio disagrees with everything Roy has to say, even to the point of threatening legal action against us for reporting what Roy said. When invited to give his version of the events, Mr. Guercio did not respond. If he does ever respond, we will be happy to include his comments. Caribou's insurance company found the fire's circumstances strange, to the extent that they told Jim they would not pay for the damage. By this time, Guercio had been through other personal difficulties, and simply didn't have the heart to go on, using a frontloader to dump all the damaged gear into an abandoned mine shaft on Caribou Ranch's extensive property. Though the barn was eventually rebuilt, Jim has only occasionally entertained the thought of having someone else open a studio in it, and he has only set foot in it a handful of times over the last three decades. But as extensive as the fire was, not all the gear was damaged or destroyed. Guercio kindly donated all that remained to The University of Colorado at Denver, under the guidance of Roy Pritts, the Dean of the College of Music. 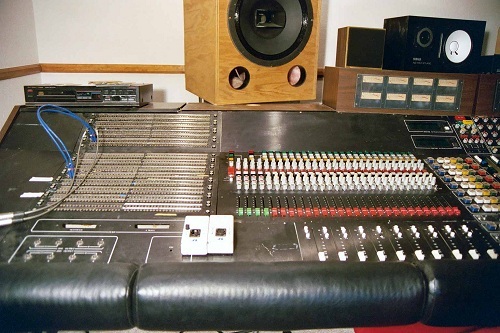 The original Neve 8016, the Olive, a number of tape machines, dozens of microphones, and a couple of tons of various other gear that had been in storage at the time of the fire was moved down to CU's Denver campus for students to learn on. The Olive was even reassembled, but only served as a conversation piece. Its power supplies pirated to serve the Neve, it languished for another decade. Craig Patterson, now president of PME Records, just couldn't stand to see that, and while an engineering student under Bill Porter at UCD, he agreed to take on the Herculean task of lighting up the Olive 2000. Taking ownership of a dozen input modules, work began on trying to find documentation and parts. With assistance from Paula Dunn, Head of Library Research at Texas Women's University, patent designs were found, and the trail of Wayne Jones was followed... but he wasn't interested in revisiting the past. However, he was willing to give Patterson something crucial. For some reason, Jones still had one remaining set of original blueprints and schematics for the console. Once receiving them on loan, Patterson made two copies of them, and sent back the fading originals. Several years later, after many dead ends and delays, Patterson was not able to have the modules pass audio. Some LEDs would light, but his technical expertise just wasn't acute enough to finesse the stubborn components, and a number of crucial items were still unaccounted for. In the mid-1990's, Clark Hagan, Grammy-winning engineer and former UCD student, decided to take up the challenge, and discovered that the Olive had been taken completely apart and put in a back room. Some wheeling and dealing for work and gear ensued, and Hagan was able to take ownership of all the parts UCD had, as well as grab the all-important power supplies from their spot underneath the Neve 8016. Hagan then contacted Patterson through Roy Pritts. After achieving a comfort level, Patterson surrendered the modules and schematics to Hagan, who by this time was in Nashville, engineering for the likes of Chet Atkins and Ray Stevens, and furthering his studies under Bill Porter. This was a busy schedule, and it kept Hagan from working full-time on the console. But he had persistence. He figured out the multiple power supplies issue, hotrodded the master section because there were no schematics, had meter boxes and side panels built, and spent some time re-wiring the Multitrack-to-Dolby connections. Mark Guercio gave Hagan the too-rare-to-find-anywhere female pins to hook into the patch bay, and work was just about done. Finally, in 1999, he was able to power up the monitor section and hear the console's electronics for the first time. Within two years, he had powered up the entire desk, and had gotten about 90% of the functions to work. So it's time for the biggest question of all: After all this time, and all this hype, what does the Olive 2000 sound like? Well, in two words, open and natural. It doesn't have the clinical neutrality of, say, a John Hardy preamp, but it doesn't have the "warmth" of a Neve, either. Instead, it's in between the two. Hearing a source through it for the first time is an ear-opening experience, giving you a real sense that the artist is right in the room with you. There isn't a distortion of color that would give it an inalterable personality. But there also isn't that sense of fatigue that can develop when listening to something that has no personality of its own. Instead, it sounds as though it's giving you the same sense of space and openness that was present in the original signal. There is no other console that sounds like this. The Olive hasn't been working reliably long enough to allow Clark to use it in daily sessions, but it is definitely getting used. As it gets used to being worked, and Clark gains more trust in it, it will see more and more use. Everyone involved with project hopes the Olive 2000 will be able to regain its rightful place in the modern sonic landscape. Wayne puts it best when he says; "Looking back, we were an enthusiastic group of engineers, passionate about audio and electronics, and had many good ideas. But we were short on experience, business acumen, and resources. Many people lost a lot of money, something I will always be sorry about. We didnt deliver what we agreed to deliver despite many long hours of work. Many of the innovations eventually worked their way into the industry. "We all wanted to bring this functionality to the industry. We were all in our early 20s and didnt know what MBA stood for. We thought good ideas, hard work, and a passionate desire would make it happen. It didnt. It did come close with a couple of consoles delivered which served for many years but there were more disappointed customers who had put their faith in our ability to deliver the ideas they had seen on paper or at trade shows. So where are the key players now? Ed Meitner heads up EMM Labs, makers of the groundbreaking DSD SACD Converters, and has installed more than 600 8-channel systems so far. Jim Guercio still lives on Caribou Ranch, dividing his time between ranching and traveling. Steve Lyman works at Dolby Labs in San Francisco. 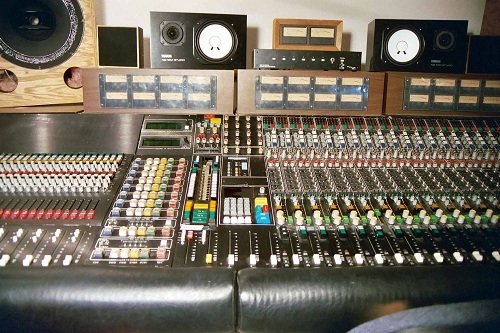 The first console built went to Andre Perry studios, the one in the converted church and shown in the pictures. After too many problems, it was removed and returned to Olive. Many years later, Andre Perry sold this studio and later opened a new studio in Morin Heights (without an Olive console of course). After Olive, Wayne Jones started Amber, a manufacturer of audio test equipment. It ran successfully for 15 years before being bought by Neutrik. In 1991, he moved to Oregon to work for Audio Precision, a tenure that would last for 15 years. He now works for Intel at their Jones Farm campus in Oregon, the facility that has developed all of the x86 microprocessors for the past 15 years or so. He is also writing, with two co-authors, a book on High Definition Audio. Craig Patterson and Clark Hagan are currently negotiating with Brian Mitchell of Studio 306 to bring the only other known console, from Thunder Sound, back to life. 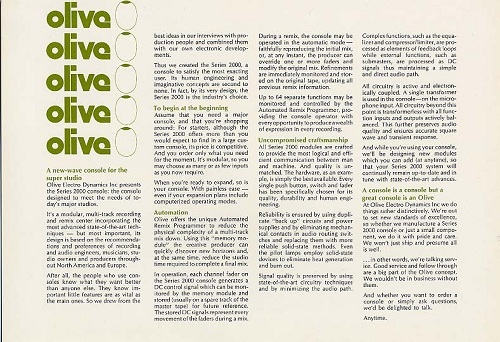 Wayne Jones has kindly scanned a TON of information he has about the Olive, including photos from the factory, photos from the 1973 AES show, and more. 1970 or 1973 - Rick Derringer, Rock and Roll Hootchie Koo - unknown which version, but it was either his solo version, or the earlier version with Edgar Winter. In either event, it's likely the entire album was recorded on the Olive. 1973 - Chicago, Chicago VI, along with its first single, "Feelin' Stronger Every Day", and its second single (Certified Gold and #4 in Billboard), "Just You 'N' Me"
1974 - Elton John, Caribou - we know this is the right time period, but we're not sure if Caribou was actually mixed on the Olive. 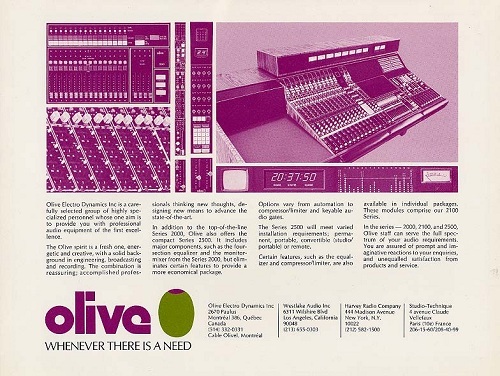 Olive Series 2000 - Console! 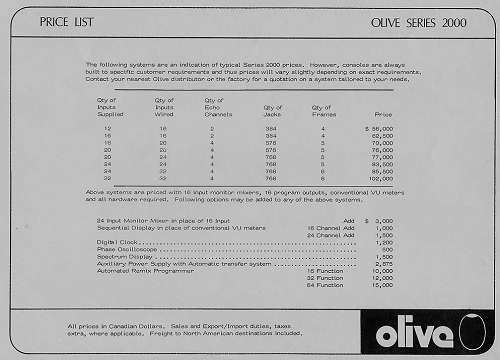 Do you have content, to add, about the Olive Series 2000 - Console or associated topics? Please feel free to Share it, here!